I drove all night and arrived safely Thanksgiving morning. The stretch right before dawn, when the black sky was just beginning to turn a charcoal grey tinged with dusty pinks and washed out ochre was the hardest. But I made it and shortly after indulged in a lovely meal with my family. One of the highlights of this trip was meeting my new nephew, Max. He's such a cute baby. I look at his face and see a world of possibility written in his curious, big brown eyes. Another highlight of the trip has been spending time with Azalea. We've been having fun. We made paper-bag puppets. The puppet she's holding up in the picture is of me - hairy Adam's apple and all. It's true that we had a feast of delicious Thanksgiving dinner-items, but I also glutted myself on a feast of little happy moments. Above is a picture of Max and Azalea sleeping together on the couch. I am finally back from my travels... at least for a few days. I got to spend a lot of time chatting with some really excellent customers at the Williamsburg show. That's one of the perks of doing the trade shows. I get to meet people all across the country involved in a truly creative community. I am lucky to hear stories and share some of my own. It's true that being on the road, traveling from coast to coast can be disorienting and really hard, but I think the benefits out weigh the cons. For a few days I'll be home and continue nesting. The process of settling in has been interrupted, but hopefully I'll be able to get a little bit more done before I head out to Asheville in a few days for Thanksgiving. 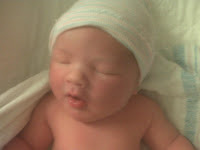 I'm excited to see my new baby nephew! I can't wait to meet him and pinch his big cheeks and kiss on his little starfish hands. I was on my way back from the bank (I had to get a new checking account at a bank that's not over 100 miles away), and out from the tape deck came black smoke and the smell of plastic. Luckily I was quick enough to eject the adaptor before it caught on fire while I was driving down the road. I am guessing that the adaptor and the older car stereo were a bad combination and created some kind of excessive friction. It must have been a glitch, because once the smoke cleared, I tried it again and it seemed to work fine. This is good. Traveling without my books on tape and music would definitely not be as fun. 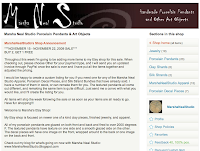 Art Bead Scene is such a great blog and features some really awesome artisan-made beads. I recently had the opportunity to act as a guest blogger and wrote about Ellen Steiber's article, The Lore of Gemstones. CLICK HERE to check it out. I was also fortunate enough to be a featured Designer of the Week. CLICK HERE to check that out. I just love Art Bead Scene! I've only got a few spots left in The Charm Club. CLICK HERE to find out more about my limited edition project and CLICK HERE to claim your reservation in this exclusive club. I've got some really awesome ideas lined up for this round of charms! Like the ceramic focal from my necklace design, The Last Bird of Winter? It's from Marsha Neal Studio and you could get your very own (and more). 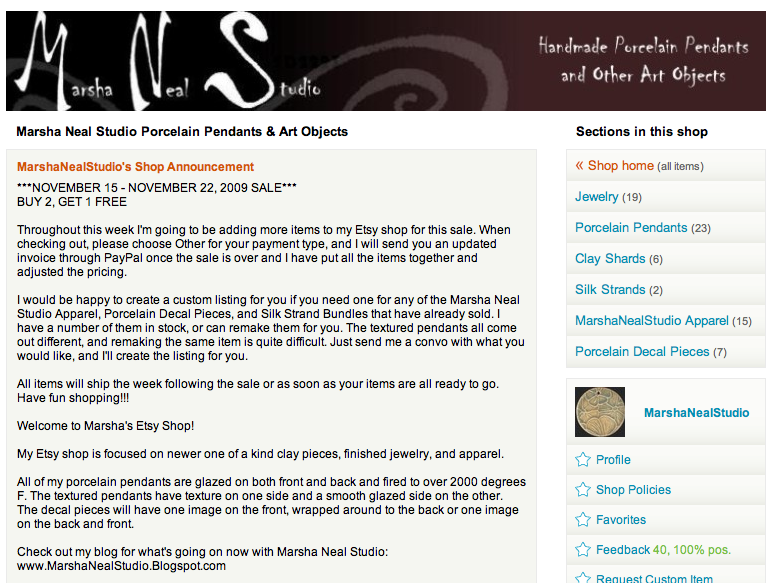 It's not too late to take advantage of Marsha Neal's Buy 2 Get 1 Free sale on her website and her Etsy shop! The sale goes through this Sunday. Don't forget to check out her blog also for a chance to win some goodie grab bags! Right now I'm in Williamsburg, Virginia for the Bead Mercantile show this weekend. As you may remember, I was just across the country in the Bay Area. (Needless to say, after many hours on the plane and just about as many in the car – my brains are mashed potatoes.) My concept of time was never very good to begin with, but after traveling back and forth between the coasts, I'm even more at a loss. Luckily, I had an excellent time at BABE (Bay Area Bead Extravaganza) and that made up for it. I just love all the customers who stopped by to say hello and all my fellow vendors. You can't imagine how happy it makes me to see familiar faces and to hear about their lives and what they've been making. It is a profound source of inspiration. Catherine Witherell of HappyDayArt! stopped by and chatted. She's just delightful! I love her blog and admire her busy hands, always seemingly creating! Bob Burkett and Barb Switzer also happened to drop by the table to say hello at the same time. Bob has been making some incredible work lately and Barb's new book, Four Seasons of Beading, is due out at the end of the month. (Check out the cover with some Green Girl Studios pieces on it! And some of my jewelry designs in the book!) I didn't get a chance to escape the booth very much to look around, but along the route to the bathroom, I stopped at Beth of Kabela Design's booth. She had some lovely new finishes on her filigree and some really cool shapes and designs. Another visitor to the table was the very talented Sarah Shriver. She's a hoot and a half! I don't get to see her very much, but whenever I do... she has me in stitches! I first met her years ago at a show in Tucson. The middle picture is of my stash from the show. It's not very big, (because I didn't get a chance to walk around much), but it has some of my favorites and even a new owl friend made by an artist named Tera Belinksy-Yoder who goes by BeadyGirlBeads. The owl friend was a gift from Cathy Collison of Glass Garden Beads. Cathy has expanded her selection of found and recycled glass components. The shibuichi skull bead is from Bob, the PMC focal is from (my delightful and witty neighbor at the show) Kelly Russell of Beadfuddled, the sugar skull buttons are from the talented Anne Choi, and all the lacy filigree is from Kabela Design. The polymer lion head charm is from Christi Friesen of CF Originals. Speaking of Christi, to the right is a picture of her hamming it up at her booth (which was also along the route to the bathroom). Christi is coming out with a book called, Steampunkery, which is due out December 9th and available for pre-order now! I only wish that I had more time to look around and more money to support my friends and fellow artisans. I'm just about to hop on a plane heading back to Pittsburgh via... oddly enough... New York. Seems like I can't escape JFK, no matter how hard I try. I'm not as technically savvy as I make myself out to be. This became dreadfully apparent (at least to me) while setting up for the presentation for the bead society. The tech person wasn't able to come and in my hands... well... it took some figuring out to do. Luckily they were all patient and really lovely. They made my job easy and a pleasure and it really was my honor to be sharing a little bit about my family and the stories behind some of the pieces. Some of the folks came up to me afterwards and said that I did well and that I seemed to have everything under control. I laughed. I was a little frantic, but am glad that I seemed to be relaxed. Someone even commented that I had very elf-like features. This was not the first time someone has said that. Anyway, I'm about to board the plane. I'll update more when I'm not about to take off. Dark and early, we made our way to Pittsburgh, where I flew out heading to San Francisco. The flight seemed charmed... I slept through most of it and all of the babies aboard (twin girls sitting a few rows ahead of me) were silent, cute, and smiling. The only thing I found problematic was that for some reason, whenever I go to stow my overhead luggage (which at times can be heavy depending on how much extra stuff I've had to cram in from the over-weight checked baggage), someone always stands up or tries to push past me. I know the desire to race to one's seat or to flex one's legs may be strong, however it's not wise. If I lose hold of it, someone is going to get concussed. There might even be blood. So it is best to be patient. I'd wait for you, Impatient Mystery Passenger. Would you please be so kind to wait a few moments for me? Thank you! After the plane ride, I picked up the rental car and drove to the show site. I'm not a big fan of driving in big cities. The traffic is too heavy, it moves too fast, and I'm always afraid that I'm going to either go off a bridge or scrape along the concrete barriers or sideswipe someone driving in my blind-spot. Luckily I've not had any problems. Once the show was setup, I met up with Anne Choi and her friend Liz for Vietnamese food at a place called, Le Cheval. The meal was tasty and I had a grand time catching up with them both. I'm looking forward to tomorrow, when I know I'm going to have to snag a set of Anne's sugar skull buttons. I'm staying at Carter and Aveesh's place here in Berkeley. (THANK YOU GUYS!!!) Unfortunately they're at a different show. It would have been great to see them and catch up, but we'll have to reserve that pleasure for another time. If you're in the area, come out to BABE and stop by to say hello. I'm also giving a presentation to the bead society on Tuesday night. Come out for that and perhaps win some prizes and pick up some more Green Girl stuff before I head back to the east coast! While I created this piece, I thought about what a winter faerie would wear. (As you can probably tell, I'm running with this faerie theme!) I also thought about at what point does one know that it is undeniably winter... I don't think there's a Weather Channel for the Fair Folk. So, I think that the sign would be when the last bird flies South for their annual migration. Therefore, I used a sterling silver bird clasp from my family at Green Girl Studios to symbolize the last bird. 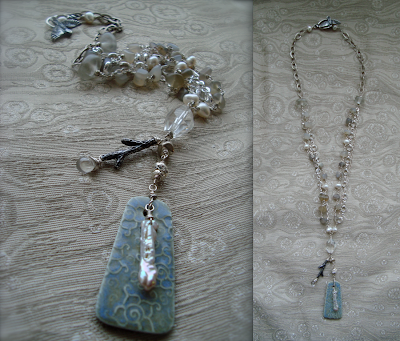 In this piece, I also used wire-wrapped tumbled agate nuggets, pearls and quartz crystal. I acquired all of these from BeadTrust. With the smaller sterling silver chain from Ornamentea and the wire-wrapped agate chain, I "cheated" and used a pre-fab Swarovski cup-link chain from Artbeads.com. The Swarovski crystal sterling silver-plated ball is from Fusion Beads. 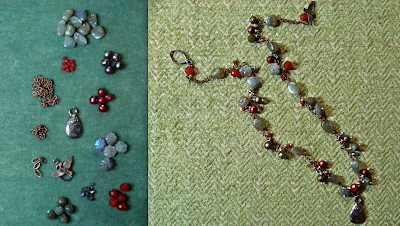 I also incorporated some recycled glass beads from Browen Heilman of GhostCow Glassworks. They heavier silver chain at the top is handmade. The focal is a lovely ceramic piece from Marsha Neal Studio. I love the chilly blue glaze and the swirly pattern. To accent the ceramic piece, I dangled a sterling silver Candice Wakumoto branch component that I had up in my Shop. At the end of the branch I dangled a Czech glass teardrop from Raven's Journey. I think this parallels the shape of the stick pearl layered over the ceramic piece nicely. I'm quite pleased with the way this one turned out. The Marsha Neal pedant has sat on my work table waiting for just the right piece to come along. I've been playing around with the new Soft Flex Extreme Wires. I love the opulence and shine that these flexible beading wires provide and have been wanting to incorporate them more into my designs. The choker to the left is a quick piece I whipped up. I did a spiral braid studded with 2mm antique simulated pearls and then loosely wove through another strand of the Bright sterling silver Soft Flex Extreme wire strung up with light grey Swavrovski crystal pearls. I also used some Bali sterling silver spacers and a silver toggle from Saki Silver. 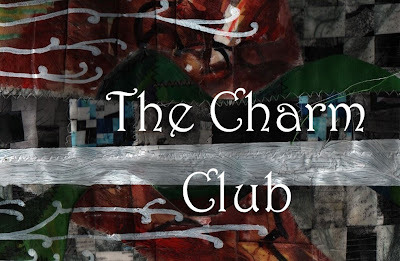 It's not too late to swoop in and reserve a spot in The Charm Club. Not only will you be treating yourself or someone you love to some really lovely things I'm making, but you'll also be allowing me to keep doing what I'm doing unfettered by limitations. You could be my hero! Rescue me and reward yourself with a treasure – actually, three treasures plus a print! 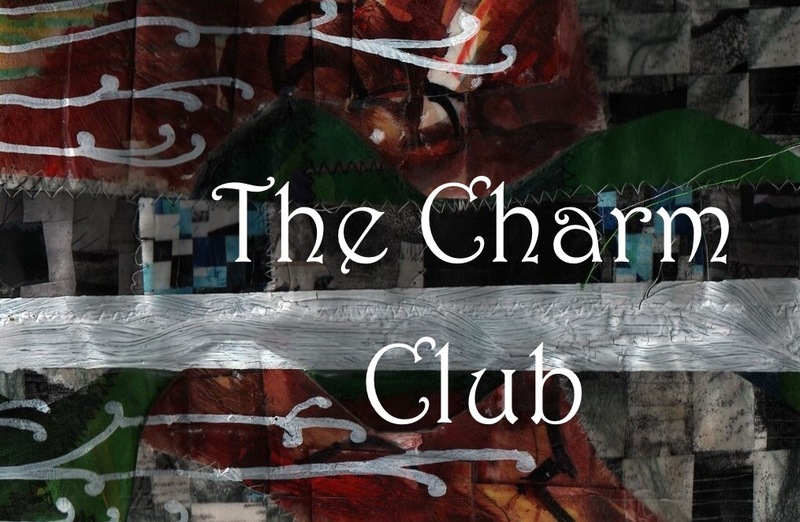 CLICK HERE to find out more about this limited edition project and CLICK HERE to claim your exclusive reservation to The Charm Club! Firstly, I want to thank everyone who left a comment or wrote privately expressing their thoughts on popularity in response to the blog post about the subject. It is indeed a prickly subject. I think for most creative types, especially ones who live off of their artwork, there is always a dilemma between the business side and the creative side. Most artists and craftsman work alone and are one-man-armies who are forced to wear many hats. The "publicist hat" being one of them. I know many artists who would be happy to be squirreled away to make their work without contact with the outside world. But as my friend Margot Potter says, "You can't eat glitter." Survival is paramount and putting yourself out there is definitely a balancing act. When I speak about not wanting to be popular, I'm addressing the situation when the balancing act goes wrong – when the hype becomes more important than the work, when being the "IT" person replaces being an artist. For me, it is more important to be true to yourself, to believe in your work and what you make, and to always be genuine. It's easy to lose sight of this. At one point, I was entrenched in the fine art world and I found myself pandering to the desires of collectors and socialites. It was getting to a ridiculous point where I was pimping out and promoting work that I hadn't even made yet. (Work I have still not made to this day and doubt I ever will.) Sure, there were fancy cocktails, trips to the Hamptons, and expensive commissions... but it was all hollow and I felt gutted. I was compromising myself. Somewhere in the jumble of all that, I realized it was more important to listen to my own voice, my heart, my soul and that through hard work and commitment to my craft things would work out. Things would be okay. I may not be a celebrity artist, but I am happy with who I am. Fame, celebrity, and popularity are ephemeral and fickle. Chasing after them is like grasping at ghosts and illusions – one is bound to fall on their face. The realms of the faery were often times considered to be sanctuaries for all manners of creatures. Some tales tell of the faerie kind and how they've receded into Otherworldly domains as refuges from the reign of man or in disgust of the human world. Some flee to these magical places because they are hunted and captured for their powers, or because their tribes and clans are at war with each other. I've created this piece with those stories in mind. 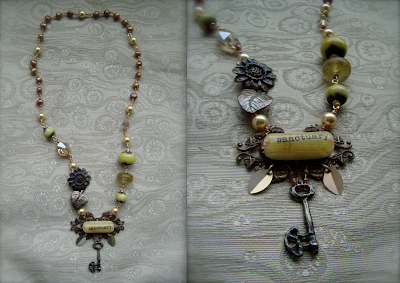 The focal of this piece is made up of a polymer and resin component from Lynn Davis of Expedition D, Vintaj natural brass filigree, vintage sequins from Gail Crosman Moore, Swarovski crystals, and a skeleton key from my family at Green Girl Studios. The rest of the piece is made up pearls and Swarovski crystals from Artbeads.com, ceramic rounds from Keith O'Connor, recycled glass from Bronwen Heilman of GhostCow Glassworks, and a shibuichi flower clasp that's also from my family at Green Girl Studios. I quite like how the piece turned out. 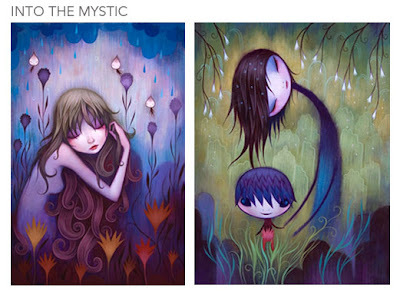 Artist, Jeremiah Ketner, is participating in a group show at Gallery 1988 in San Francisco called, Into the Mystic. The opening reception for the exhibit is this Friday, November 13th, 7-10PM. Since I'll be in town for the BABE (Bay Area Bead Extravaganza) show, I think I might drop by if I'm not too jet lagged. If you won't be in town, you can CLICK HERE for an online preview of the pieces Jeremiah will show. If you are in town, check out the art and come by the bead show Saturday and Sunday! I have been struggling internally of what to do about an email I received. I have decided to address the major issue here, as I know she is a blog reader. I'm not going to go into the details of the letter, just that it rubbed me the wrong way. I can tell that the author of the email only wishes to help, but I think our ideas of success are divergent and that we don't necessarily see eye to eye. The contents of the email basically said that I needed to be "more popular" and that I could use a dose of "shameless self-promotion." I can understand the advice and I think that for others this may be sage advice indeed. Promotion is a valuable tool. My problem is that things like popularity don't really matter to me. They never have. Even in high school, when these things seem paramount, I just did my own thing and if I got on with other people then great... if not... oh well. For me, I think it's more important about being genuine and honest and fostering good relationships rather than wracking up thousands of followers and quasi-friends. I could think of my life like a business, of what I could get, how to get more hits, what social networks would best suit me, how to climb that ladder and scale that pyramid and basically how to be a superstar, but I'd rather spend the time making things and just do my own thing. I have too many things to do. One may fault me with hosting giveaways on my blog or commenting on other people's blogs, but in truth... I do these things for other reasons. I host giveaways, because it's important to me. The idea of sharing and reaching out is strong in my mind. Commenting on others' blogs also falls into this camp of reaching out and creating community. I don't do it out of obligation or to reach a quota, I do it because I want to. Each of us is capable of miraculous and amazing things and together, like-minded individuals can achieve even more grand and mind-blowing feats, but this can only be sustained on a sound foundation. If an empire is built on matchstick connections, it'll undoubtedly crumble and burn. Even though I don't agree with the author's opinion or advice, I do want to say THANK YOU. Thank you for reminding me that popularity is only an illusion. I re-read some passages from Jonathan Strange & Mr. Norrell by Susanna Clarke and kept coming back to the scenes with the Lady of the Castle of the Plucked Eye and Heart. I probably should heed my mother's warnings of never reading before bed, because I had the strangest dreams about that particular realm in Faery. When I awoke, all I could think about was what the Lady might like to wear and then I set out to make a necklace to suit her. In my unearthed box from Artbeads.com, I found a box of different colored Hemp Cord. I normally don't work with fibers very much, but wanted to try it out. I like the rustic quality the cording provides and the earthy tones it comes in. 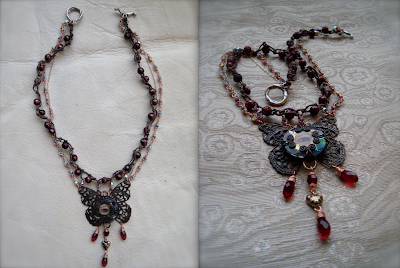 Below is the necklace that I made with the Lady of the Castled of the Plucked Eye and Heart in mind. I knotted the hemp cord and then wove champagne-colored Soft Flex Extreme Flexible beading wire through the knots in the cording and strung up the faceted pearls. To this I added wire-wrapped Swarovski crystals, chain, and a mixed media focal I made from patinated natural brass filigree, a watch crystal, resin, watch cogs, vintage sequins, and a tiny eye collage with gold-leaf. The mixed media focal was one of the charms from The Charm Club I hosted last go around. I dangled more Swarovski crystals from the focal and a Candice Wakumoto bronze heart from my online shop. To close it up, I used a sterling silver toggle from my family at Green Girl Studios. I think the silver tone goes nicely with ABx2 finish on some of the crystals. Above is a close up of the focal of the piece. I think the eye and heart motif and blood red Swarovski crystal teardrops go without saying. Last year, a friend had a wonderful idea! She suggested that I start my own Charm Club. I had a lot of fun and worked out the kinks from the first go around, and am ready to have another go at it. If you're not familiar with The Charm Club, it's kind of like the cheese of the month club, where you get a new and different SURPRISE cheese every month in the mail. Instead of cheese, you'd be getting a limited edition charm made by me in your mailbox every month. The club will run in a three month cycle and be limited to ONLY ten individuals per cycle. (The folks at my new post office are already starting to recognize me!) The fee to be paid in advance is $75 and would include shipping. That's less than $25 a charm! Normally, the one of a kind charms I make go for much more, but since I'll be making them in small editions of ten, it'll balance out economically for me. The first charms will be ready by the beginning of January. WAIT! There's more! At the end of this cycle, I'll include a limited edition print of one of my works for each of the participants. This would make a perfect holiday gift for a dear friend, beloved partner, or even for yourself! CLICK HERE to visit the Shop and sign up today! The kitchen is unpacked and I decided to celebrate by making a cake. I made a butter cake with a butter cream frosting. I topped the cake off with apricots that I stewed with vanilla beans and spices and then soaked in rum. I boiled down the remainder of the stewing liquid and mixed in a little rum to drizzle on top. I guess since it looks like a bunch of sunny-side-up-eggs-over-easy, then it's okay to have it for breakfast. I once lived in a doll factory. The first two floors were devoted to the production of dolls and the top two floors were renovated into huge loft spaces. It was in a cheerless part of town, what they refer to as an industrial park. The cold seemed colder and the shadows seemed longer. 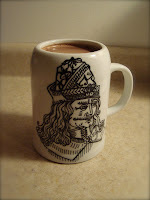 One of my then five roommates and I devised a way to combat the cold – hot chocolate. It may not seem like anything new or special, but it was just what we needed to lift our spirits in those cold winter months. We had all the fixings: marshmallows, chocolate and other flavored liqueurs, and a wide array of mugs to chose from. The best part was that we would get all bundled up (it was expensive to heat the entire loft), make the hot chocolate, and sit around and talk for awhile. The other roommates would be holed up in their rooms or doing other things, but we would sit and talk for hours while we sipped our hot chocolate and fought away the winter blues. Tonight I was a little blue. The quiet seemed a little too quiet – the cold a little too cold. Instead of moping about, I revived an old tradition. I used the mug painted by Gina Chalfant of White Swan Illuminations. She gave me this mug with Count Dracula painted on it at the Pittsburgh show on Halloween. I used a blend of chocolates recently unearthed from the move and dropped a marshmallow in from Whimsy and Spice (not shown). It's a small pleasure, but an important one when the cold comes. 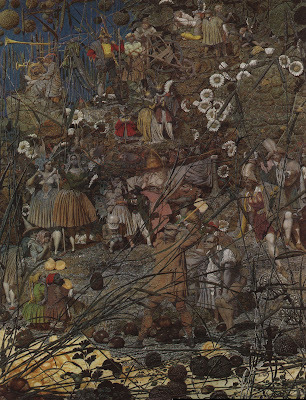 It seems apt that this monthly prompt for Art Bead Scene should be The Fairy Fellers' Master-Stroke by Richard Dadd. 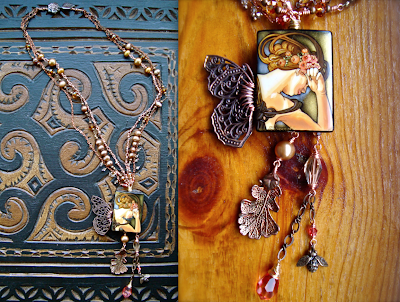 Cynthia's book, Enchanted Adornments: Creating Mixed-Media Jewelry with Metal Clay, Wire, Resin & More, was released November 1st and it certainly is magical. Not only that but November also hosted FaerieCon which took place in Baltimore this year. To get me more in the spirit of the challenge (and pass the time while unpacking from the move), I started listening to Jonathan Strange & Mr. Norrell by Susanna Clarke again. The detailed world Clarke portrays is perfectly enchanting – filled with footnoted folklore, faeries, and dueling magicians. While unpacking, I came across a package from Artbeads.com. Within it was a piece of folded up, purple tissue paper. I gingerly opened it and out fell a black, onyx, hand-painted Russian pendant. The image on it was the Evening Star by Mucha. How could this treasure slip past my notice? I adore the meticulous skill that goes into crafting each one of these miniature works of art. Laying around was an antique brass butterfly filigree. I knew that the pieces had to go together. It took some time, power-tools and a lot of patience, but I figured out how to wire on the wings to the pendant smoothly. I really love this faerie inspired piece came together; it was like magic! My schedule has been a bit topsy turvy lately. One of the benefits of this is that I am up at dawn, enjoying watching the mist roll in and the deer run through the woods. I think this is my favorite time of day. The world is waking up, I'm sitting quietly making things and all seems right. 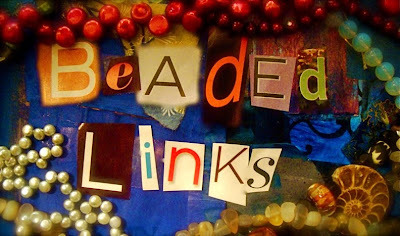 It's Arts & Crafts Week on Lisa's A-Bead-A-Day Blog! A different craft product is featured each day with ideas for incorporating them into jewelry pieces. Stop by and share your ideas! Make it merry with holiday jewelry and crafting ideas. An Art Bead Scene first – the December sponsors collaborate on a special set of art beads for the December monthly challenge prize! Barbe is the last link in a Necklace Round Robin. Check out the finished pieces! Carmi uses a leather button to make a wearable collage. Cindy has developed a new line of jewelry to reminds us all to live life slowly and enjoy what we have. First in the series is "Grounded." Jean describes what it's like to edit someone's book and shares her thoughts on Marcia DeCoster's latest, Beaded Opulence. Cyndi is giving away a copy of Ronna Sarvas Weltman's unique polymer clay book called, "Ancient Modern". Come and get in on this contest! Live of Sulfur is finally in Lorelei's repertoire of jewelry techniques. Jean is amazed by the treasures you will find in Cynthia Thornton's spectacular wonder of a book, Enchanted Adornments! Melissa tries out Friendly Plastic (and likes the results). Andrew adds new pieces from Hawaiian artist, Candice Wakumoto, to his shop. I've received a lot of emails asking me where I've disappeared to this past week. It's all been a blur really – a box filled blur. Most of this past week has been spent unpacking and settling in. It is taking time figuring out just where everything should go. I am no where near close to finishing. The above photo is the view from my studio window around dawn. It looks like a landscape by Egon Schiele. I've been listening to books on tape while I sort through and go through everything. It's a daunting task, but it needs to get done. So far, things are going well out here. Things are falling into place, slowly but surely. Of course, there are challenges. One of them being that we are finding it difficult to get connected to the internet here. My solely connectivity, besides driving 30 minutes away (which I have done to post this), is through an iPhone. It's like a gossamer ribbon, connecting me to the rest of the world... thin and delicate and slowly unfurling. I'll be without the phone this coming week, so my internet time will be even more limited. The other big thing, which I knew about in advance and am becoming more used to is the cold. The mere mention of 63 degrees and my nose would start running... but with the aid of some thick sweaters and heavy socks, 63 degrees turns out to be quite a pleasant temperature. I'm also not used to driving everywhere and that the bodega is not half a block away. Since moving in, I've gotten up more than once with the proclamation that I was running out for some soda, before realizing that Junior's and the Associated Supermarket aren't just down the block. Defeated, I walked over to the refrigerator and wrote it down on the shopping list for my next trip into town for groceries. I have been enjoying the new apartment and the quiet. I like being up early, watching the deer go by and the birds alighting on the barren branches. There is a peace here which is soothing. At times it can be a little maddening, but all in all, I am happy here – where I am. With the move at the center of my attention, I didn't get a chance (until now) to add some new hard-to-find Candice Wakumoto pieces to the shop. I just love the new pieces. 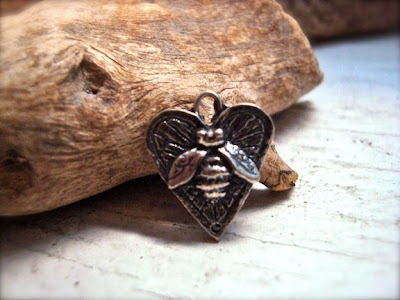 I got lots of skulls and bees in both bronze and sterling silver. Make sure to drop by the shop and see what's new. CLICK HERE to check out the new Candice Wakumoto pieces. So, I finally figured out how to send pictures from my phone over to my email account. Here's a photo Greg snapped of the new baby, Max! Isn't he cute? I can't wait to pinch on his big cheeks! So, I am finally settling in here in Pennsylvania. The drive up was spectacular. The roads were lined with brilliantly colored trees and the air was cool and crisp – perfect for rolling down the windows for a refreshing cold blast. Along the way, I would catch a whiff of smoke here and there. I love the smell of wood fires and leaf burnings. I guess it reminds me of autumn and the time that my best friend and I lit a fire in my childhood plastic playhouse to make baked potatoes (and consequently melted one of the walls). I don't think I've had a better baked potato. I saw the Monica Cook show at Marcia Wood Gallery in Atlanta with Anne Choi and Lynn. It was a great show. If only I had a million or two laying around and then I'd have a few of Monica's beautiful paintings, glistening and dripping with painterly life. It was a nice stop. I was able to rest and stretch a little, catch up with Anne and Lynn, and get caffeinated again. I survived Atlanta traffic just as rush hour was starting. It was like a scene out of the Fast & the Furious. My stay with my family was nice, but all too short. Cynthia and I always come up with a thousand things to do. It seems like we came up with even more than usual, even though I was only there for the day. One of the things we came up with, was a craft challenge. Each of us got the same components and had to come up with a design. Each kit contained faceted pearls, labradorite, copper chain, a fine pewter charm, a shibuichi toggle, carnelians, and Swarovski crystals in heliotrope and dark red coral. We were allowed to use any stringing materials and findings in addition to the kit, but had to use everything from the original mix of materials. I finished mine up in record time! I really love the little fine pewter courage doll. I think this would be a perfect necklace for anyone embarking on a new adventure. Unfortunately I didn't get to stay long. We had fun though and then I was back on the road again. Everything was going smoothly except for the traffic jam in New York during rush hour. What should have taken 15 minutes took three hours. I learned two things: I'm not a good driver, but I'm also not a bad driver. At least I use my turn signal and don't park in the middle of the intersections causing gridlock. After loading up the last of my possessions, we headed out to Pittsburgh for the Bead Mercantile show. I really like the show. Mostly because of all the nice people who attend. I had the pleasure of seeing Gina Chalfant of White Swan Illuminations, Leslie Zabel of Bei Mondi, and Melissa (who I met maybe five years ago and didn't believe me when I said I made the Metamorphosis necklace in Stringing magazine way back when). The other good thing about the show was that I received a call from Greg letting me know that Cynthia gave birth to Max. He's such a cute baby! 8 pounds and 11 ounces. Max is a Halloween baby. Too bad Cynthia didn't get to go to her doll show, but I think that meeting Max for the first time far outweighs any doll convention. I can't wait to see him! The other good news from the weekend is that Cynthia's book, Enchanted Adornments: Creating Mixed Media Jewelry with Metal Clay, Wire, Resin & More came out! The wait is over! It has finally hit the book stands and is being shipped out from Amazon. I really am so very proud of Cynthia and the Interweave team for all the hard work that went into making this book. It really is amazing. So many hours went into making this the best book it could be. I am looking forward to the new adventures unfolding before me: a new home, a new nephew, a new time to make magic in the studio.